I was in the grocery store last week and saw that they had some soft shell crab. I bought a few and decided to fry them up for dinner. I decided to go with a simple tempura style batter. The batter was very light and turned out much better than I thought it would. The next time I make this I would try to incorporate some panko bread crumbs into the batter. I also threw together a nice Asian coleslaw to serve with the crabs. You can find the recipes below. I had a few crabs left over and decided to make a soft shell crab sandwich the next day. 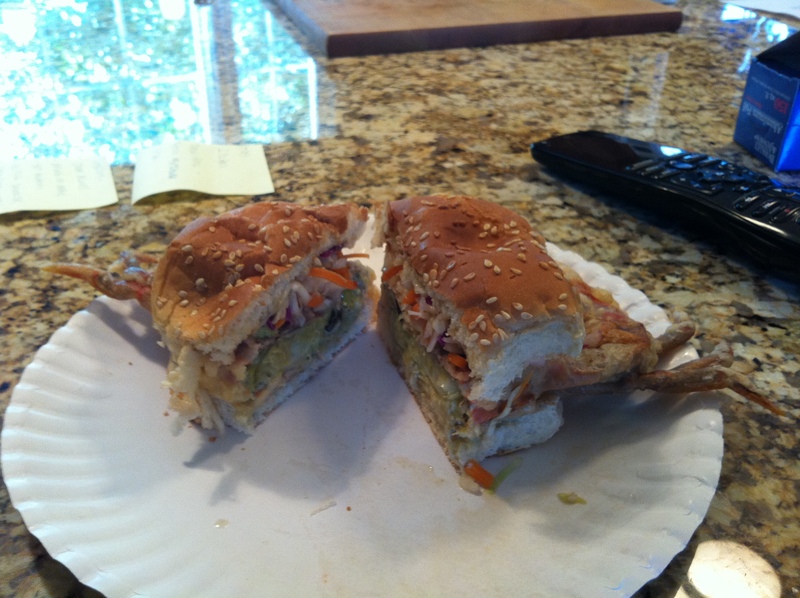 The coleslaw worked well with the crab and I made up a nice wasabi soy mayo to put on the bread. It turned out to be a great way to use up the left over crabs. Enjoy! 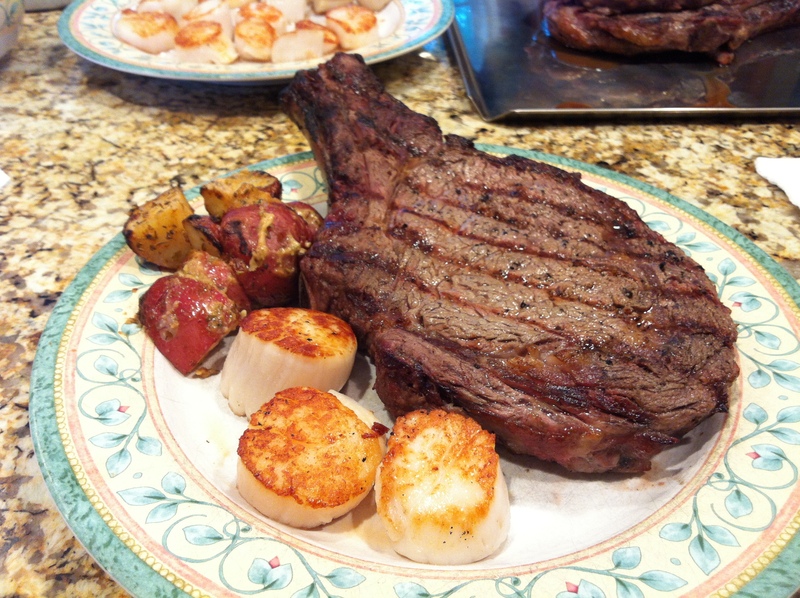 Earlier this week I made up a nice surf and turf with a ribeye steak and some sea scallops. I also experimented with some grilled potatoes that I marinated in a chipotle sauce. For the steak I just sprinkled on some kosher salt and fresh cracked black pepper then cooked it to a nice medium rare. For the potatoes I wanted to try something different and looked up a few ideas for grilled redskinned potatoes. Most of the recipes I found were pretty basic so I modified a few to add some spice to the potatoes. I thought they turned out quite well and were a nice change up from a regular baked potato. I cooked the scallops on Himalayan salt blocks. If you can I highly recommend getting one. They cook some of the best scallops I have ever eaten. They are also good with tuna and thinly sliced pieces of beef. The most important part of cooking with a salt block is to make sure you heat it correctly. You need to take your time to not damage the block. I go over the proper way to heat a salt block in the recipe for the scallops. 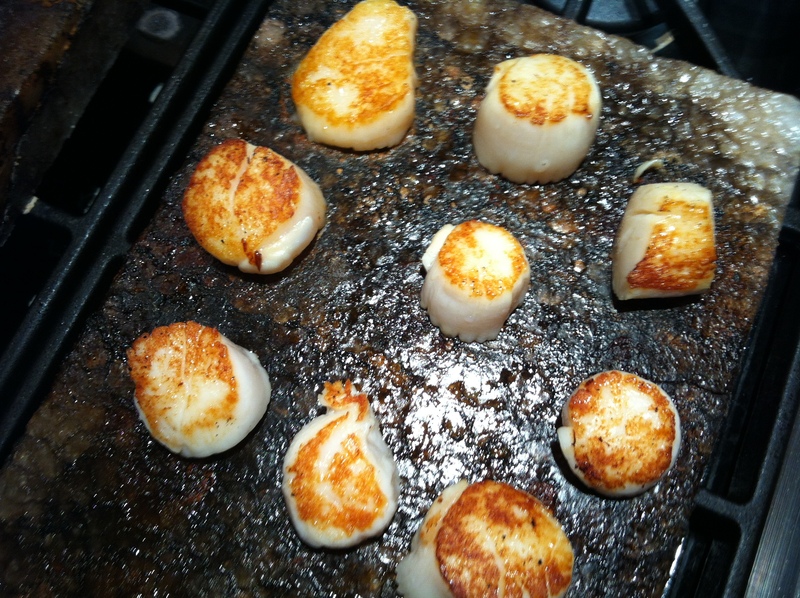 The salt blocks give the scallops a fantastic sear and a light and salty seasoning. Enjoy! 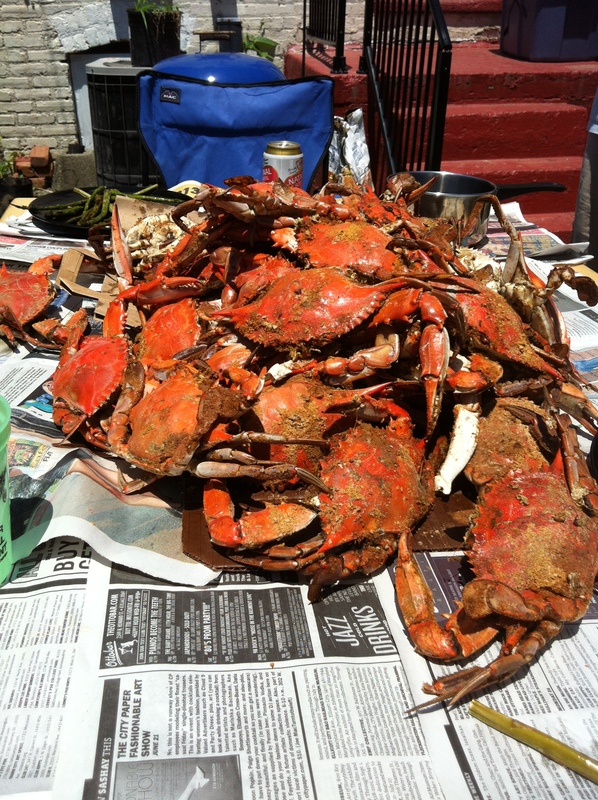 This past weekend I went down to Baltimore with my roommates from college for our annual crab feast. The past few years we have gone to a crab house but this year we decided to buy the crabs from a seafood market and have them at our buddy’s house. 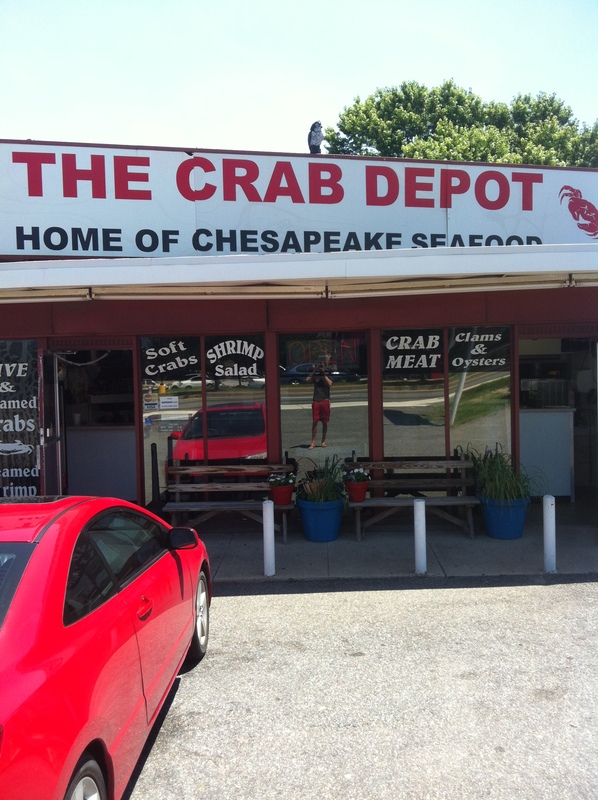 We got the crabs from The Crab Depot, The crabs were steamed perfectly and the crabs were all quite sizable. 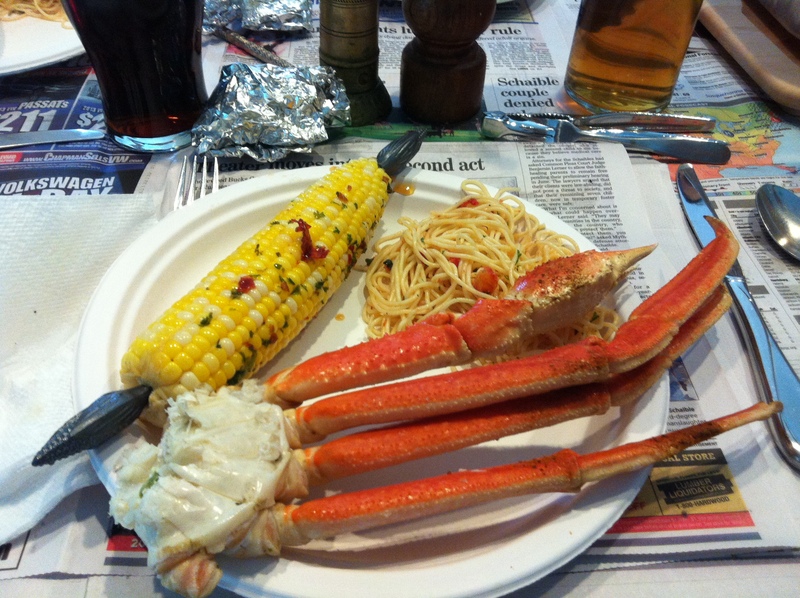 To go with the crabs we grilled up some corn and other veggies then put down the newspaper and started the feast. It turned into an epic battle of man versus the sea and lasted over 3 hours. It turned out to be a great weekend full of good food, good beer, lots of beer, and good friends. I can’t wait till next year! Last night I decided to mess around and attempt to make one of my favorite appetizers, mussels marinara. Now I like my marinara sauce on the spicier side so I added jalapeno peppers to this batch. However if I were to make it again I would use Italian hot peppers instead of jalapenos. All in all the recipe was very simple to follow. Before cooking the mussels be sure to submerge them in ice water for a few minutes to get rid of any dead ones. After cooking them be sure to throw out any mussels that have not opened. You can serve this over pasta or use bread to dip into the sauce. Enjoy! This is a very easy to make appetizer that is sure to impress. 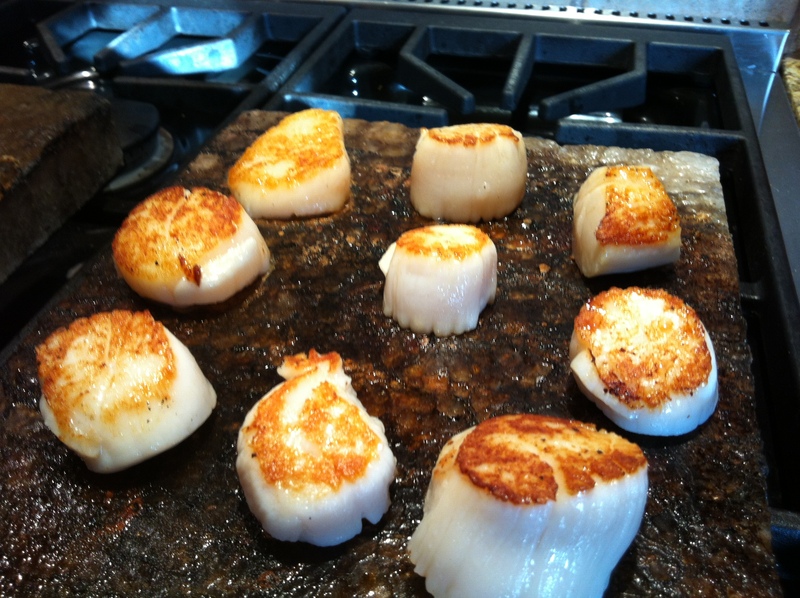 If the scallops you use are very large be sure to cut them in half so they all cook evenly. When picking scallops try to find dry packed, they cook better than wet packed scallops. Make sure to precook the bacon. by precooking the bacon you solve the problem of having either overcooked scallops and crispy bacon or perfectly cooked scallops and undercooked bacon. You can pair the bacon wrapped scallops with ginger BBQ sauce or a nice cocktail sauce. 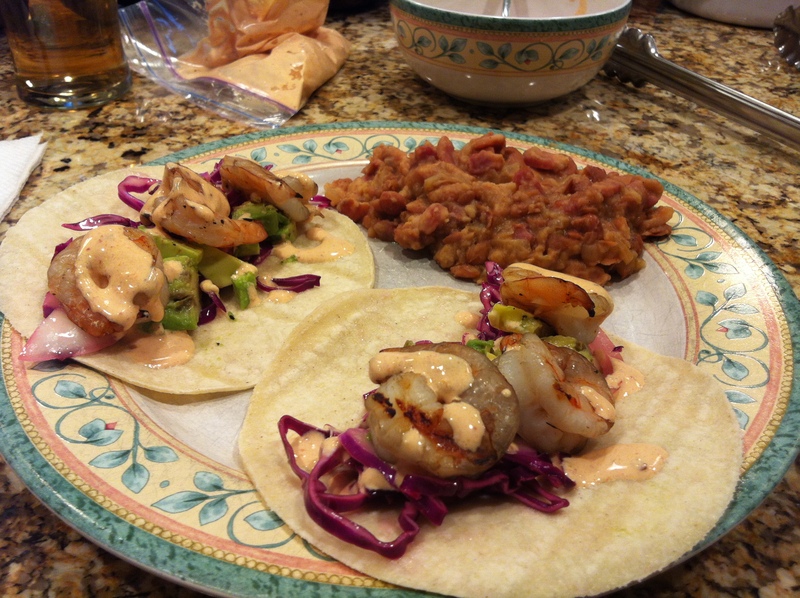 You will find the recipe’s for the scallops and the BBQ sauce below. Enjoy! I just finished up the Dinner with Robert Irvine event and I must say it went pretty well. While there were a few technical difficulties in the show overall it was a great experience. During the program we cooked two dishes with Chef Irvine, sauteed shrimp with strawberry salsa and spinach polenta and pork tenderloin with a mustard pan sauce and a potato peach hash. Both dishes were delicious but the shrimp and polenta was the stand out dish of the evening. 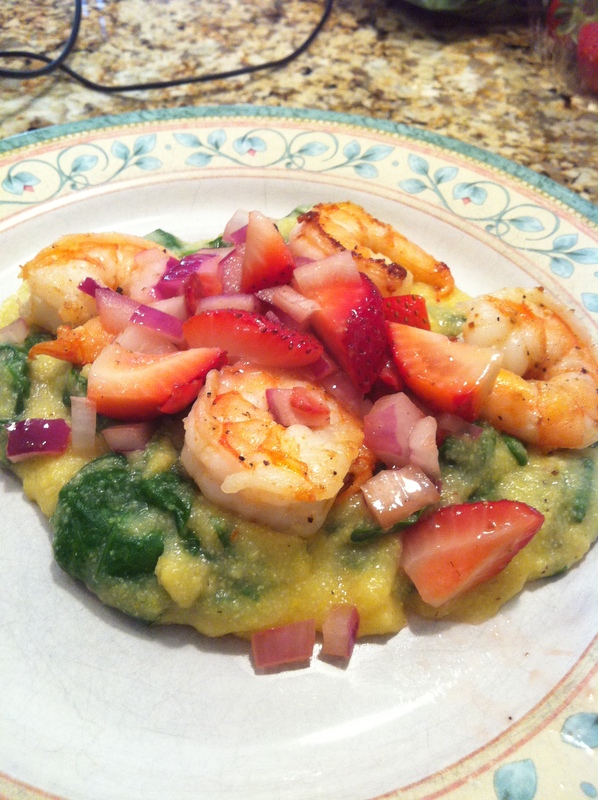 I had never thought to use strawberries over shrimp, the flavor combination worked so well. 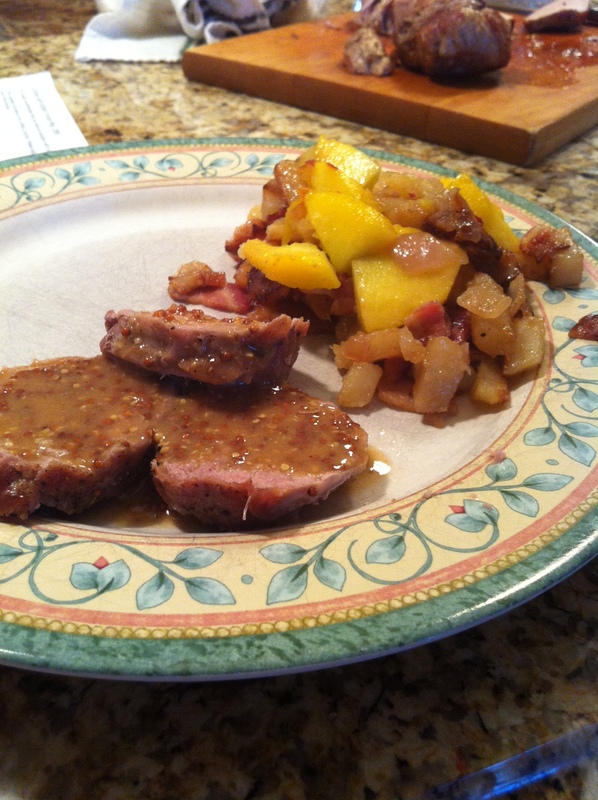 The pork tenderloin and hash was also delicious. The use of peaches in the hash was a surprise but again, much like the strawberries, just worked. This whole experience has changed the way I think of fruit. Now I do not view fruit as dessert or something that stands on its own and I will be experimenting with new uses of fruit in main dishes and appetizers. The only critiques of the event I had were he could have slowed down a bit, at times Irvine went into full chef mode and was pushing out parts of the dish quite quickly. Also it would have been helpful if we received a full ingredient list with some directions for prep, ie chopped, diced, etc. Also a heads up about preheating the oven would have been a big help too However overall for the first time doing a show like this I thought it went very well and I learned a few new techniques and will definitely be making the shrimp dish again in the near future. Firstly I want to thank all of the service men and women who have made the ultimate sacrifice for our country. I would also like to thank those currently serving and hope they come home safe. 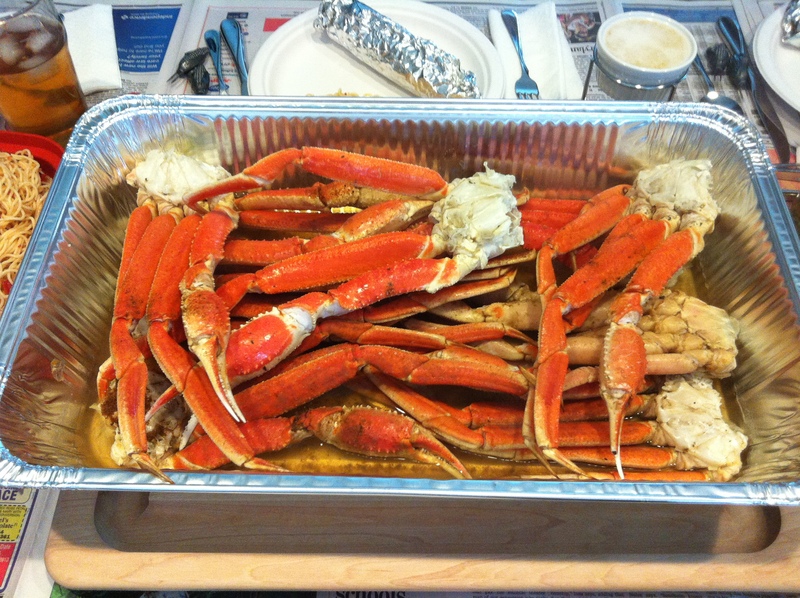 This past Memorial Day we had a snow crab feast. We started out with a few appetizers and playing some back yard games with the family. We steamed the crab in the oven in foil pan for ~40 minutes. This allowed us to cook a lot of the crab at once instead of smaller batches in a pot. We served the crab with Summer spaghetti and corn with a lime chipotle butter. On Mother’s Day I cooked dinner for my family. 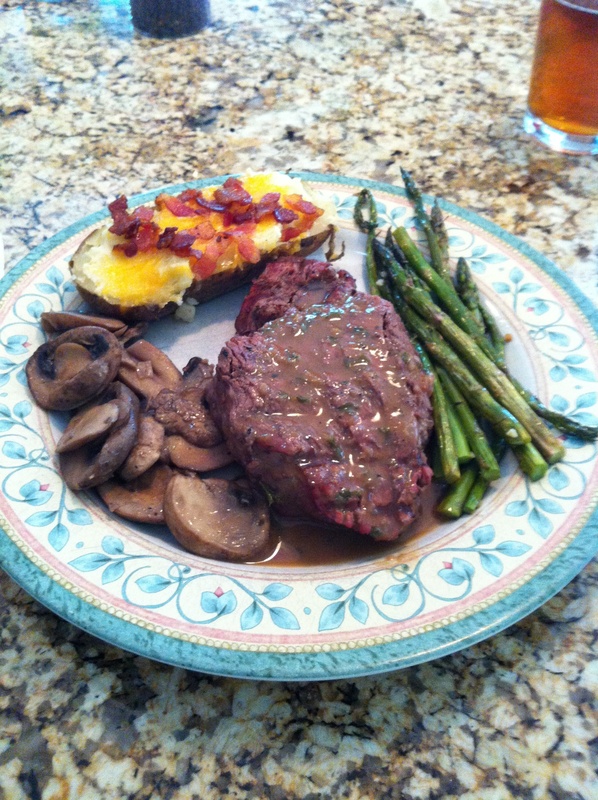 The menu was made up of Fillet Mignon with the Guinness reduction, double stuffed potatoes with cheese and bacon, sauteed mushrooms, and oven roasted asparagus. Putting the meal together turned into a family effort with everyone pitching in on various parts of the meal. I’m getting closer and closer to perfecting the Guiness reduction and should have the final version of it nailed down in the next few attempts. With this attempt I was focusing on getting the right consistency to allow the sauce to grab onto the steak better. For dessert I made bananas foster. Now I am not a huge fan of cooked fruit and was surprised with how well it turned out. The bananas foster will be getting a dedicated post in the very near future. I hope all of you also had enjoyable Mother’s Days.